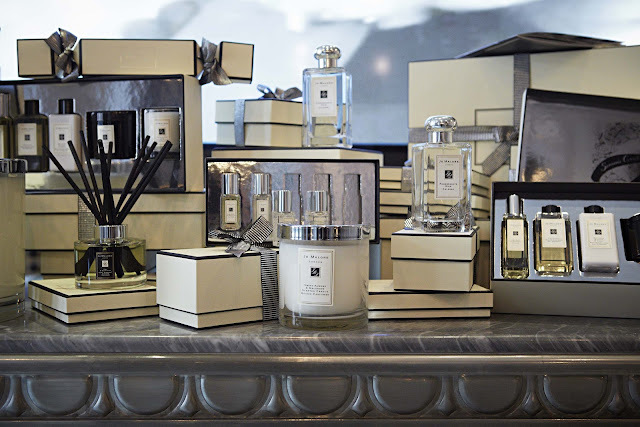 Jo Malone London does Christmas and something for right now…. Yep. It’s that time of year again. Summer. Or as the beauty world knows it – Christmas. Jo Malone had a preview of their Christmas offering this week. Held at the Connaught Bar in Mayfair, it was the perfect showcase for this year’s Christmas theme – The Connaught is also mentioned in India Knight’s Comfort and Joy – set around Christmas – so it worked perfectly for me. I understand that this bears no relation to Jo Malone’s Christmas – but its a bloody good read. There is a large selection of newness and old favourites being brought back in different sizes and Limited Editions. I’ll preview it properly before Christmas but its nice to have a peek no? If all this Christmas talk JUST as the sun breaks out over the UK is making you think ‘Oh DO ME A FAVOUR’ you can always pop along to selected Jo Malone London boutiques and pick up one of these hand-drawn boxes from their artists in residence when you make a purchase. Beautiful eh? If this is what the Olympics brings to London beauty retail – bring it on.